The best is the enemy of the good, or so said Voltaire. “Amadeus,” Peter Shaffer’s historically dubious drama, examines that dictum under a cold, hard light. The story revolves around the recollections of Antonio Salieri (Miles Anderson), the former court composer for Joseph II, Emperor of Austria. Three decades earlier, he was at the height of his powers: a member of Joseph’s inner circle, respected, wealthy—a good composer. Enter Mozart (Jay Whittaker), a former child prodigy who grew into an obnoxious man-child—an iconic composer. 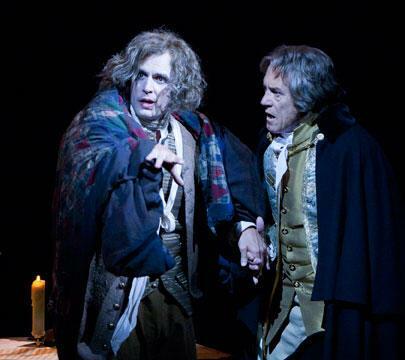 Thirty-two years after Mozart’s death, an aged Salieri claims to have murdered him. Is it true? The rumor mill turns vigorously and Salieri flashes back to the events that transformed him from pious courtier to backstabbing fiend. As the story progresses, we find that Salieri is passionate, conflicted and deeply covetous of his rival’s talent. He witnesses Mozart’s genius with a mixture of awe and anger. Anderson’s portrayal highlights Salieri’s implicit acknowledgement that he is good enough to identify Mozart’s genius but lacks the talent to emulate it. Perhaps it wouldn’t be so bad for Salieri if Mozart weren’t such a sophomoric twit. He constantly rubs his excellence into the court composer’s face, even rewriting (improving) one of Salieri’s pieces on the fly. Whittaker deftly portrays Mozart’s immaturity and occasional self-awareness but, to some degree, he seems to reprise his frenetic turn as “Mad Tom” in the Globe’s 2010 production of “King Lear.” Winslow Corbett deserves praise as Constanze Weber, Mozart’s long-suffering wife. Her interactions with Salieri are particularly biting. The rest of the cast are mere foils in this epic duel between musicians. Though, to be fair to Mozart, he’s only intermittently aware there’s any conflict at all. As usual, Adrian Noble’s direction moves nicely. The costumes are about what you would expect–neither imaginative nor confusing. Several, but not all, of the characters sport upper- or lower-class English accents, perhaps as shorthand for class distinction. Again, neither effective nor off-putting. In the end, the production is much like Salieri’s talent—good but not the best.